It is thought that this photograph shows Mr Meyrick and Mr Riches, sound engineers, whose firm Raylec Ltd was set up in 1936 at 43 High Street Banstead - the site currently occupied by Collingwood Sound & Vision. They are standing in front of a vehicle that appears to sport a loudspeaker. On the panel in the background above the car can just be detected the words Banstead Glass Works, and it is thought that this was located at the rear of Wingfield House in the High Street. Can anyone confirm these details and/or add any further information please? The year 1938 is an estimate. 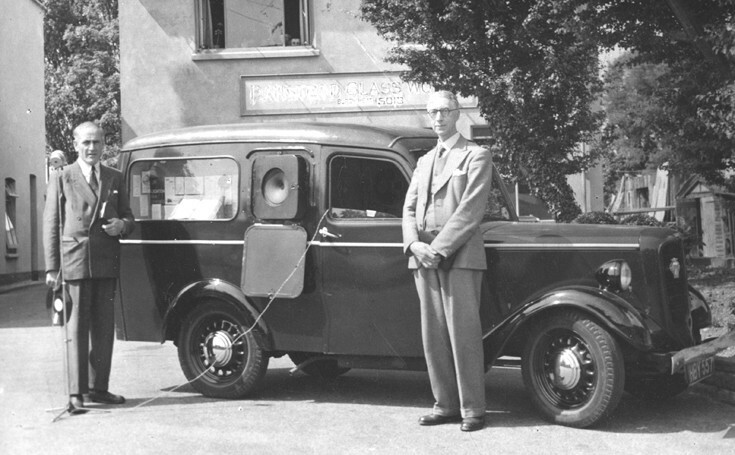 Raylec was originally set up in 1936 by Mr ... Meyrick. As far as I can recall he then sold the business to Frank Riche and Eddie Pain, both of whom were working for him, in 1938/39. Shortly after the outbreak of war they were called up and the business was closed. It reopened in 1945/46 when they both returned and continued to trade until their retirement when it was sold to Collingwood. For several years the address of the business was 4 Buff Parade, High Street. Yes, I confirm Don's thoughts as to the position of Banstead Glass Works at the top of Wilmot Way. Can Don and Janet be given my email address? Janet appears in the Cinderella Picture! Between 1958 and 1965 I worked for Raylec, a small, excellent company to work for - as straight as a die, something one cannot always say about many service companies today, regretfully. I worked for 'Bill' Pain and Frank Riche as a TV service man together with Peter Collingwood (no relation to the company which took over the firm on the partners' retirement), Bert Farley, Mick Privett and Arthur Chapman. Happy days! Is that a Bradford van? I remember Banstead Glass Works. As a youngster in the 1950s I went to them to try to buy a glass blank to make a mirror for a reflecting telescope, as suggested in a book by Patrick Moore! They said I would never do it and wouldn't provide one. Wingfield House was the building occupied by Bowditch, the estate agents and was set back slightly from the High Street. I cannot recollect exactly where the glass works were, but I think they were alongside it. As noted, Raylec was on the corner of Wilmot Way. Next (or next but one) to that shop was Mitchell's that sold toys, and the last shop in the short parade was Cullens, the grocers. Next to Cullens was a section of rough land - was it a demolished pre war teashop? - that was developed into a parade of shops in the early 1950s. I think the glass works was on the other side of this, but it may have been behind Bowditch's; it definitely was near Wingfield House. It’s a job to recall all the detail of 50-60 years ago! The row of shops to which Michael Funnell refers was known as Buff Parade before it became High Street. Starting from the Wilmot Way end the first property was a Lady's Hairdresser followed by Raylec then Mitchell- Newsagent & Tobacconist Valdor - Chocolates & Sweets and finally Cullens. As Raylec was No.4 I guess the numbering started from Cullens. Access at the back of these properties was only to serve individual garages. The Glass Works was laid back beyond Cullens. Thanks to Don Pain for correcting me on Buff Parade. I should have added in my last comment that Mitchell’s was a Newsagent & Tobacconist and not imply it was just a toy shop. However they did sell toys as well, and in particular Meccano Dinky Toys, which were certainly of interest to me an my friends. I take Don Pain’s comment “The Glass Works was laid back beyond Cullens.” to mean that the Works were further along the road towards the Victoria as in my previous comment. I think the Works were approximately opposite Watkins Garage, but towards the Victoria ie near Wingfield House but, as Don says, laid back. I have looked at the picture more closely. I would say definitely that is a Jowett Bradford van. My friend’s father had one and it’s old design flat twin engine had an unmistakable sound! These were made between 1946 and 1953, although the 1930s “Easiclean” wheels give them a prewar appearance. Based on this fact the photograph is therefore post war and later than 1938 suggested date. Could this photograph just be posed for publicity or was it part of an event? The shadows are very short suggesting the time is around the middle of the day in mid summer. If my above recollection of the Glass Works location is correct, I think the loud speaker would be facing the High Street; it’s certainly facing a southerly direction without shadows of buildings behind the photographer. Were they providing music (the gentleman on the left is holding a gramophone record) and sound for the Coronation celebrations that took place in the High Street in June 1953? Whilst at school, I took part in a parade along the High Street at time that dressed as a knight in chain mail armour! All these comments about the High Street got me thinking about the other shops I remember of the late 50s and early 60s. How about Barlows the newsagent between Raylec and Valdor? Towler electrical store opposite, next to Woolworths. Skidmore the chemist. Robert Fuller by the roundabout (where I had my wedding suit made). Garcombes ironmongers down near the Woolpack. And Cole the fishmonger near the Institute, always known to Raylec staff as 'Kippers, Winkles and Whelks'. Dexters photographic shop, previously Van Dack. The Ibis under Martyn Goff. I could go on, I wonder how many more are fondly remembered of that era? More about the glass works and these shops can be found on picture 316 . My mum got newspapers delivered from a shop by the old Boots. Im sure the shop sold toys. The shop had a wooden floor! I wish I could remember what the shop was called. There was also a bycycle repair shop down the alley that lead to Lambert Road(?) I think it was called Gratelys. Was Dunmore the name you were thinking of? The shop sold toys as did many newsagents. You've jogged my memory - I think there was a bicycle shop down the alley - could have been Greatley(s), and I think it was related to Greatley(s) Coaches/garage in Diceland Road. Next to Dunmores was Banstead Fisheries and the alley was alongside that, if my memory is correct! Next to Boots was French & Foxwell Garage which then became Rose and some years later Brew Bros. Opposite Dunmore(s) was a group of shops set back; Firmins, I think, was the name of the florist/plant shop and, as mentioned above, Coles fishmongers. Could well have been Dunmores! Do you remember the upstairs of the old Boots? I think there was a small library. I really must go for a walk along the High Street. I remember the the petrol station! There was Watkins at the top of the High Street (whats there now, I wonder). Can anyone recommend any good photographic books of the High Street and area from around 1950/1960's? I have Now and Then and a History. So good to share these memories! More shop names from the 50s. Cato's - a hardware shop near Woolworths. There was also a bakery on that same parade and a jewellers. Down the other end of the high street, at the top of Harbourfield Road was Lewin's the Estate Agent (where my mother in law, Alma Saunders, worked), Mrs Durling's sweet shop, the United Dairies [Express Dairies], Mr. Roe, the hardware shop (I can still smell the paraffin!). This shop was a goldmine and so full of stuff one could hardly make one's way to the counter. Mr. Roe always wore a brown overall. Along that same row was Dean's, a bakery. During the war, there was a British Restaurant on the other side of Harbourfield Road, which became Freeman's, a curtain and furniture store, after the war. I see that Jill Burgess has commented on shops in the High Street and wondered if visitors to your site would be interested to read my description of Banstead High Street; it is on my website www.norkbooks.com under the heading "Sidelines". I think you mean Express Dairies rather than United Dairies - at least near Woolworth's. There was a jewellers nearer the Post Office - can't think of the name. The chemists next the post office entrance were bought by M&R Townsend, who, I think, had their first shop at the parade at Burgh Heath, and then shops at Tattenham Corner and Woodhatch. I think it was Skidmore's, The Chemist, near the Post Office. Apart from Boots there was also the Chemist opposite Barclays Bank. I do not remember the Shop name but the Pharmacist was Mr. Wadsworth, father of Ann, who married a Norwegian and went to live near Bergen. Michael Funnell remembers the jewellers near the Post Office. It was as I remember called B.A.Side. Michael also states that the South Southern Co-op had premises next to Woolworths, which is correct, but as far as I remember that was for hardware and curtains etc. The old-fashioned pulley system for carrying cash to the cash desk was in the food Co-op roughly opposite the Church Institute. The co-op next to Woolworths had several shops, all linked, and you could walk from one to the next. The pulley system was in there for money, and my mum had a number she gave to the assistant when she bought things. There was a shoe department, clothing and furniture. The Nurseryfare was on the corner where the entrance to the car park is. There was also a Nurseryfare near Carters, newsagents, opposite the Woolpack. There was a United Dairies, opposite the school. I remember having to cross the road from school to get to the canteen for lunch! Got the Banstead Past and Present but really wanted photos of 1950/1960's. Any ideas? REPLY FROM WEBMASTER:Hi Jill, the era of postcards was the early 1900s when people used them as we use text messages on mobile phones nowadays. This means there are far more cards from 100 years ago than 6o years ago. I do have a few in my collection, and the Banstead History Centre at the library are scanning them all to make them available to visitors. They also have some film taken around 1950 which shows the shops along Oaktimbers. The only other place I can suggest is the Frith's site as many of their photos date back to the 1950s and 60s. Thank you so much! I am on my way to the library asap! Message from LNW - Hi Mark, I have a very good colour photo of the cottage and it also appears in one of our books Banstead Past and Present. I am also sure I have one of the interior. Click on the thumbnail to see the full size version. I have come across this site, having been attracted to the picture of my father, Frank Riche, in the top picture. Wonderful, as I had no pre war pictures of him. Very interesting to see the comment from Don Pain, I remember him and his father. Very pleased to remember the memories of Adrian King, although the only name I remember from the staff was Peter Brown who sold me my first motorcycle and started an interest I still have today. My mother is still alive and she worked at the hairdressers at the top of Wilmot Way,next to Raylec. It was called Scotts and she also remembers a Miss or Mrs Tew who ran the sweet shop in the early '40's. I also remember all those old shop names recalled by others. Note from LNW: Hello Jon, thanks for your comment. Here's a question for your mother - I am told there was a big tree right in the middle of the road at the top of Wilmot Way, but despite years of searching, I can find no image that shows such a tree. We have however found a reference to it in council minutes. Does your mum remember it, and better still, does she know of any photograph which shows it? I remember you from my time at Raylec (1958/65) and I remember your mother Kath and her Pryrenean mountain dogs. Other members of staff during my time there were: Pete Collingwood, Bert Farley and Mick Privett. There were others who came and went during this time also. I never knew a Peter Brown. Where is Simon? Went to school with him! Remember him being flattened by a van on the A217!! Broken leg etc. Thanks for the replies to my posting. My mother worked at Scott's from about 1933 until the War and lived in Banstead from 1946. Last year she moved down to a home near me in the New Forest. She knows nothing of the tree at the top of Wilmot Way. Frank was a keen photographer but has no pictures of Banstead. Adrian, I was most interested in your memories and my mother was so pleased you remembered her and the Pyreneans. I must have got Peter Browns name wrong as he sold me the motorcycle in 1962 and, until then, travelled everywhere on one. I first knew him and his bikes from c1955. He got married in the later 60's and rented the flat above the shop. Was Pete Collingwood any connection to the present owners? He may also be the one I remembered as Peter Brown. Your posting of February brought back so many memories, I remember all those shops and some of the people from them. I went to school with Mr Cole's son Alan, Mr Dexter lived near us in Holly Lane and took my wedding photos and who could forget The Ibis which was quite a magnate to me. Clive, I do remember you as a friend of Simon. Unfortunately Simon died suddenly last year whilst out walking his dogs near his home at Buxted. Now I have found the site, I will explore further as my mother may well have something of interest to add. Note from LNW; Thanks Jon, and don't forget to check out our main Banstead site at www.bansteadhistory.com which includes many local publications, I am sure that your mum would enjoy our Past and Present book showing old photos and the same location today. As far as I know Pete Collingwood had nothing to do with the Collingwoods who took over Raylec after Pain and Riche retired. They already had a shop in Cheam, if I remember rightly. Hi Jon, Clive here, the picture is probably set in about 1953; just look at the cut of the suits, very austere! Ration time! The van/estate vehicle was built after 1946, so the date of 38 is well out. Sorry to hear about Simon,he was a good friend. I need to put a few things right as far as other peoples comments. OAK TIMBER'S consisted of a lot more shops than most have recalled. I am now scratching the GREY MATTER! Going from Harbourfield Rd. to Glenfield Rd. Oak Timbers parade had a lot of shops, very diverse. Starting with Dixon-Hind (estate agents) at the corner of Harbourfield, then the half shop of Greeves (sweet & tobacco),half shop wich sold ladies underwear & wool. Then on to dear old Mr. Roe the Iron Monger!!!! Poor old devil, a first word war quartermaster, but he stocked everything! Whether he could find it was a different matter! Next to his shop was Tituswards a grocery shop. My mother worked there during the WWII. Jackson's the shoe shop, with his magical viewer to see if the shoes fitted. United Dairys, we could buy a tin of broken biscuits for 2s&6p.A large tin that was. 7lb.!!! John's the chemist, Leslie's the sweet & tobacconist with his pullout tray to choose your desire. ( JAMBOREE BAG!?) or sherbert dip? Then last of all was Fosters Wine Merchants. Jill Burgess the shop you remember for papers was Gustersons, next door to Boots. Everybody keeps on about Banstead Glass Works, to my memory yes it was laid-back in a large property, the man that ran it was not very helpfull. I broke too many windows during my time & still remember my visits there. Does anybody remember Winkworth Hall? Mr. Gould took his classes there after marching us down the High St. come rain or shine from the main school. Yes I grew up in Banstead, my earliest memories are from about 1951/2. We had milk delivered by horse & cart! The horse was called NEDDY! The milk-man was John House. Banstead has changed over the years, but The Ibis is still there. Thank you Mr. Goff. MG 5 & all that. I still live within walking distance of the village (TOWN) & shop there on a regular basis. If anyone needs to know more, just ask, I MIGHT remember. TTFN. P.S I forgot the bakers in Oak Timbers! I tend to agree with you that 1953 is a more likely date. That means the man on the left is unlikely to be Mr Meyrick who left Raylec when Messrs Riche & Pain took over after the war. I think Michael Funnell may well be right to connect the picture to the local Coronation Parade of that year. Frank was the technician and assisted with many early outside broadcasts, he worked with "Uncle Mac" at times. The man on the left must be the commentator/MC but who was he? It is interesting that a book seems to be open for inspection in the back of the van, was that some sort of record of the Coronation? Clive, you have aroused more memories with your thought on Oak Timbers. Yes, I remember the Jackson's foot viewer. I remember the half ladies underwear shop as I once wanted to buy my mother some gloves and had to overcome the embarrassment of being a young lad surrounded by ladies underwear, I couldn't get out quickly enough with my purchase. Boots had a book lending library upstairs and my mother and I were regular visitors. Winkworth Hall, was that where we had our school lunch, which would explain the daily walk? I am almost tempted to take a trip back to explore the modern Banstead. I remember milk deliveries by horse when we lived in Hillside prefabs and bread deliveries from "Dendy Napper". Hi All, If anyone knows the whereabouts of a street directory (published annually i believe) for Banstead High Street in the 50s, that will tell us exactly which shop was where. Pinto was a great pet, unfortunatlety he was knocked down by a motorist who brought him home. Pinto was put to sleep on 6/6/66 a date i will never forget! My parentents & sister moved to Scotland, I did not. I helped out at Banstead Place for many years, 1962/ 1971, Doing the dishes or bathing the male patients if need be, doing the evening rounds of drinks, (Hot Chocholate, tea or what ever). During a Summer term the Matron offered to put me on the pay-roll, I refused. It was not my need to be payed, just to be there and help! I have many happy fond memories of Banstead Place. I met my first wife there! I moved off to Kings Lynn in 1972, that was a move too far. After 5 years we moved back to Sutton. We now had a son, twenty odd years later everything changed. New wife, son has emigrated to N/Z with his daughter & wife. How life changes? I left Yewlands Close in 1972 & have never looked back before!? It makes me relise all the lost connections are gone! How many BCS Boys or Girls, or Nork Park exe's still live within walkig distance of the village? Banstead has changed! It would be great to meet up with people who remember me, please don't be shy! give your names & "E" addresses. I now live in Epsom and visit Banstead almost weekly, I get my nails done in a shop that was a music shop but cannot remember what it was before that.I would love to still live in Banstead, I married in All Saints in 1974. I really enjoy all the memories from everyone on this page! I too would love to hear from anyone who knew me! hi jill and clive and any other ex residents of yewlands close great memories!! Some memories of a short section of the High Street . I must firstly apologise for some repetition of previous contributors’ information in my account. My family and I moved to live in Garden Close in the late 1940’s; 1949 I think. We lived at the bottom of the road on the cul-de-sac. Our garden was adjacent to the alleyway which went, and still does, north-south from Lambert Road via Sandersfield Road up to the High Street. This alleyway ran south past the side of our garden and past two lock- up garages, then into the High Street. The first lock-up was occupied by Frank Greatley who was a member of the the Greatley family. He ran a bicycle repair business from here. The second was owned by a Mr Davey (can’t remember his first name) who ran a furniture repair and re-upholstery business from here. He was a short man who always wore a full apron and walked with a very pronounced limp, as children we were all terrified of him. We would try to run past the garages without him spotting us. At the top of the alley as you entered the High Street on the left was the Bank Building, now HSBC and next to that the Ibis Library as it was then. On the right was the wet fish shop located in what is now Specsavers, I think the name may have been Cole. Alongside that was the Newsagent owned and run in the fifties and sixties by the Gusterson family. Prior to this I believe it was Dunmore’s. The shop was very dark inside an issue not helped by a noisy wooden floor. Alongside newspapers, magazines and tobacco products the shop also stocked a variety of items including toys, I particularly remember die cast model cars, and a range of other basic goods. In the early sixties I worked for the Gustersons delivering newspapers on what I believe was the longest paper round ever. From the High Street the round took me via The Drive and Piquets Way out to the far end of Tattenham Way and then back across the Reigate Road and down Chipstead Road, through the woods to Holly Lane and then back to the village via Court Road and Avenue Road. All this took just over an hour on a good day and it paid 7s 6d (37.5p) per week. Next to Gustersons was of course Boots. At that time Boots was advertised as ’ The Cash Chemist’, but it also had a library on the upper floor, which you had to pay for. This was in the days before the public library. Then came the entrance to the forecourt of French and Foxwell, who were dealers for Citroen cars. This entrance was adjacent to the tree of which only the stump remains today. The area which was occupied by French and Foxwell was once the site of a pond, long since filled in. I guess that in its youth that old tree would have stood alongside the pond. I was very fond of that old tree; I could see it from my bedroom window in Garden Close. The bank building was, I think, Midland Bank. Cole or Cole's was the name of the fish shop on the village school side of the High Street almost directly opposite the alleyway. The fish shop next to the alley was Banstead Fisheries as far as I recall. There were two fish shops almost opposite each other! Also next to Cole's was flower/plant shop. Was it Firmin's ?? The newsagent was Dunmore and it sold "Matchbox Toys", which we thought were much inferior to Dinky Toys which I don't think they stocked. You could buy Dinky Toys from Mitchell's near Raylecs though! French & Foxwell were superseded by Rose (Garage?). I can't remember the exact name, but definitely had Rose in it. The person there (unlike at Watkins Garage) was very friendly towards us boys for asking for lapel badges etc. I don't remember what they were, but no doubt were of cars or oils etc. There was a flower/plant shop on the other side of garage entrance. Was this Firmins? Did they move across the road? Do I have the name wrong? Were they two different shops? Anyone with a better memory than me?! Also next to or near the garage was WH Smiths, which I think closed in the middle to late 50s. Did the flower shop move to where Smiths was? The public library was roughly opposite the police station, and near (next?) Freeman's the furniture store. Where the "new public library and school" are was a field. I remember running summer sports races there. The last of the "old shops" in my memory to close was Banstead Corn Stores, roughly opposite the church. Like Clive Bloxham we had our milk delivered by horse and cart from Hodges Dairy and we lived at Burgh Heath. I don't know how far he travelled, but there were nose bags of hay on the cart for the horse. The horse pee was a bit whiffy too as it ran down the road! I've just had a memory "flashback". I think the plant/flower shop next or near the garage was Lancefield's or something similar, and I think they may have had a source down Woodmansterne Lane. I remember the two fishmongers located opposite one another. Cole's was on the school side of the High Street. I attended "Picquets Way school" with Alan Cole who was the son of the proprietor. I thought the other, larger, fishmongers was Leach Bros. Does that sound right to anyone? Yes Jon it does. Now you mention the name I am sure that you are quite right. Leach Bros.
Leach Bros does seem to "ring a bell". You could be right. Am I completely wrong in saying it was Banstead Fisheries? Did it change hands from Leach Bros? I went to the village school between 1949 (8?) and left in summer 1954, when daily trips to Banstead ended. Hi all, yes I am glad to have stirred the GREY-MATTER of us all!!!?? David Hopkins! You have a brother JOHN! A very close friend of my brother Howard. They worked at the cycle shop that was burnt down! Got it! OLDACHERS!!! Blimey that took some searching into the grey matter! Yes David you also lived near Heady & his sister, plus you also lived near the Casterton family. Probably my first Girl friend Roberta! Well Leach Bros. was the fish mongers. Ask David Jennings, on the same side of the road as the IBIS. Lancefields was the florist & yes they had a plantation in Woodmansterne Lane. The family lived at 47, Yewlands Close. Oh boy you have disturbed another deep part of the grey matter with your memories. The set back shops on the school side, the Undertakers next to the Banstead Church Hall, the Institute. A lot went on there too. It housed the baby Clinic, the Blood Donors, Scout & Guides performances the W.I. plus a great deal more! The old house next to the junior school was derelict for years. Then you had the old cottages, also derelict before the set back shops. The old cottages were that old that they had bricked-up windows from the window TAX. Well unfortunately the IBIS has gone!!! The only remaining long standing premises along the High St. is The Nat West. Formally National West Minster Bank. I rest my case. Please stir up some more memories! Re the florist that Monica mentioned,I passed it this morning and am sorry to say that it looks like it is now closed down as it was empty. Note from LNW: A new Deli selling home made cakes is due to open on the premises shortly. Hello all, In answer to Clive; yes my brother is John and you have set my grey matter working. I had completely forgotten that he once worked in the cycle shop. John now lives in Sydney, Australia but will be in the UK in about three weeks time. I will go out of my way to try to get as many of his recollections of Banstead while he is here. If you remember any more please respond. I seem to recall that it was the house next but one to the school that was derelict ie the one that was set back. Next to the school was a big house that had a wall with railings on top alongside the pavement. It also had of lot of tall Sycamore (I think) trees. A high wall formed the boundary between the boys' playground and that house! Hi David, ask John about the sea scout platoon? As for the bicycle time they all thought that a metallic shade of green was COOL! The group of them decided to cycle down to Cornwall, one of them fell asleep in the saddle en-route! Ouch! I had a visit from my brother last week, he will be 70 years young in November! Told him about your (David) recollections & he has gone away scratching his head? Just hope I can get him to log into BHRG. His memories should go back to 1948/50!Bestwishes to all, Clive. Hi Clive, I became 70 years young last January and it was my brother John who went to sleep and fell off his bike and had to be recovered from hospital. As mentioned before I will talk to him at length when he is here in the hope that we will be able to add something usefull to the Banstead History Site. David it's Clive again! When John comes over ask him about the FIRE @ the cycle shop, that should set him off. Oh yes their bikes were LIME GREEN! Yes I have sparked an interest in my brother, he remembers lots of Banstead streets before they were tarmacked + the horse drawn cart for the delivery of milk. Note from LNW: gentlemen, where was this cycle shop and do we have a picture of it? Hello LNW and Clive, I remember quite a bit about the horse drawn milk cart, I think, more later. As for the cylcle shop I am a bit vague on it now but I think it was next to George Dexter's photographic shop 'Dexter Studios' which is now the Fuji Film shop. If I am right it would have been where Marie Curie is today. Clive you may have other ideas but it was near there I am sure. Hi LNW, The cycle shop was opposite the church or car-park entrance. There should be a reference to the fire event in the Banstead Herald Archive. It made the Front Page! My last recollection of the shop was under the ownership of a family called OLDACHER, I was at the old junior school & one of their daughters was in our class (SUSAN). Scratching the grey matter very hard, I think the fire was 1960/61? or maybe 59/60. Shop No. 49 or 51? As to one of the other cyclists with John Hopkins I think their name was Wick Staple? Regards to all, keep scratching the heads, Clive. Note from LNW: Thanks David and Clive, I have many postcards of Banstead High street so will see what I can find. I have found an entry in a 1958 phone book for a G Oldaker Cycle Sports Dealer 55 High Street Banstead. Note from LNW: Thanks Christine, that sounds like the place. Any information about what was either side of it, as shop names are not always very clear on postcards. Note to LNW: I can confirm Christine's phone book entry. G Oldaker appears in the 1955, 1957 and 1958 listings at 55 High Street. Then he seems to dissapear; Fire maybe? LNW is there any way you could let me know how the numbering goes in the High Street. Also any clues that you may be able to find from postcards as to possible names, or even part of names for shops would help me to try to find them in directories etc. In 1954 the shop next door but one to the cycle shop 59 High Street was F. C. Collinson Hairdressers,I understand that it is now Oscar's Hairdressers. Oakshott Ranger Ltd Fuel Mchts was registered at 57 High Street Banstead in the 1958 Phone Book. There was also a Jewellers near by to this, I bought my EX a Charm bracelet & watch from them. You also had Walker's the Green Grocers, The Wilmot Bakery, somebody must have a picture of this parade of shops!?? Note from LNW: try picture #134 I will see what else I have in my postcard collection. Sorry to hear about the florist closing but a deli with home made cakes sounds yummy - and quite the in thing at the moment. To all contributors. I have added a few more images today which might help. Anyone fancy having a go at naming all the shops in order? Thank you LNW! This has really made the grey stir.#368- Valdor, confectionary & tobacconist. One of the proprietors reminded me of Alfred Hitchcock! William Mitchell, books & art materials. Raylec, TV & radio. Ladies hairdresser, name escapes me? #369- Eastmans, dry-cleaners. Next two shops are a mystery. Walkers, green grocer. Wilmot Bakery. #371 From the Esso sign- Lancefields, florist. Co-Op butchers. Co-Op grocery store. Finlay, tobacconist & café. Gerrards green grocer. Hearns the butcher. W.H.Smith, stationer & news agent. Next shop ???. Entrance to flats above shops. Next shop ??? Hawkins, school uniform supplies & gents outfitter. Entrance to flats above shops. Madge, ladies hair dresser, with gents at rear. Banstead Corn Stores, garden & pet supplies. Not too bad I hope? Keep delving. Thank you Christine, it makes me feel better that my memories of the village of the 50's is not that bad after all! How's about the other end of the village. The War Memorial end. On the corner of Park Rd. High St. & Sutton lane. There was a café by the bus stop on the westerly route of the 164/164A next was a bomb site! then a rather small building that was the Woolpack, Tonges the grocers, Garcombes the iron mongers, the Police Station, Parker's the butcher, a grocery store who's name eludes me at present, they delivered to many properties along Park Road & Kingswood! Then the Green Hut (Methodist Church), A row of houses, then Barclay's Bank. In the row of houses was the base of the district nurses & a Solicitors office. I will leave others to fill the spaces on the other side of the road for Carter's the news agent ETC. if you can? The grocery store next to Parkers was Hawes Stores. This evokes memories of sawdust on the floor and my mother walking with me and pushing my sister in the pram from Holly Hill Drive, across the allotments to give her order to Hawes which presumably was delivered the next day. What a fascinating thread! I remember David Hopkins and Michael Funnell from early school days. And Clive Bloxham’s memories brought back a few of my own – not least of his brother, Howard. Howard was my best friend at the junior school, and when he and his family moved away, I felt bereft for weeks afterwards. Clive mentions Alan Cole, whom I also remember. He was a year or two younger than I, and I knew him slightly at Picquets Way. When I left school in 1960, I became a junior reporter on the Banstead Herald, and I wrote a feature about Alan when the Ministry of Defence sent us a publicity shot of him posing by a jet fighter (I think he had joined the Fleet Air Arm). Other names – though of businesses, not people. In addition to the many names mentioned above, I recall the Kraal Restaurant opposite the Victoria, and the Launderette (what a modern innovation!) a few doors away. The Kraal was, I think, Banstead’s first experience of ‘exotic’ food – in this case South African. Skidmore’s the chemist, already mentioned, next to the Post Office, was run by Mr Woollatt, and not far away were T. Furniss & Son, the coal merchants. The estate agent Morgan Baines & Blackford were also in the High Street, a few doors along from Banstead Cycles (which also rather curiously sold sporting guns and cartridges!) Another estate agent was Dixon Hind, who also had a bungalow-style office next to Sutton Station, where I waited endlessly for the 164A. So far as the Co-op and its magnificent pulley system is concerned, I even remember my mother’s ‘share number’ – 253388! Finally, there was a bank on the corner of High Street and Harbourfield Road – and if my memory serves me (which it may not, of course!) it was Martins Bank. In the middle of the High Street was and still is Barclays of course, and I seem to remember a Provincial Bank (before it became National Provincial) opposite the Post Office. Oh, and wasn’t the Westminster Bank nearby, on the same side as the Post Office? Days remembered fondly, though almost certainly not faultlessly. I still visit Banstead three or four times a year – and, I’m happy to say, I never tire of it. I don't remember a bank on the corner of High street and Harbourfield Road but definitely Lewins, Estate Agents was there. This I remember because my late mother in law, Alma Saunders, worked there. Mrs. Darling also had a small shop (I can still remember the smell of her perfume!). Another memory - of the other end of the High Street - was a tin hut where I learned ballet and tap. It was an off-shoot of Miss Sheldrake's Sutton School of Dancing and we were taught by Miss Barry and her mother Mrs. Huggett/Huggins played the piano. Angela Harbour and Shirley ?? went on to be professional dancers, Angela went to Ballet Rambert I believe and I think Shirley went into musicals of some sort. We had a Display in Sutton Public Hall every year and I still have the programmes somewhere in the loft. Yes, I remember you Peter Denton and also David Hopkins is a name I recall as well. I struggle a bit to remember detail and I realise it's important to record the years in which things happened or existed, but that's not always easy. In 1953/1954 there weren't any shops opposite the Post Office except for the coal merchants office and waste land. On that side of the road, Cullens Grocers was the last shop in the parade. Also there weren't shops on the western side of Watkins garage either. There was a rather strange multi island roundabout at the Victoria end of the high street, but I cannot recall details. The Westminster Bank was where the NatWest is today, but I don't remember when it opened - middle 1960s I think. Anyone remember when the Burgh Heath telephone exchange (in Diceland Road) become automatic and was the initial figure 5 added at the same time? I found it daunting as a child to respond to "number please?"! Whenever I think of Banstead my immediate mental picture is of the period 1950-1970. David Hopkins responding. Yes I remember the telephone exchange. I have been trying to remember when it became automtic also but I can only give a date when it was still operated manually. I met my future wife on May 8th 1965. I remember it so well as it was the 20th aniversery of V.E. Day. The young lady concerned lived in Thornton Heath and I can well remeber that when I used to telephone her for some time after this date I used to have to ask the operator at Burgh Heath to get me the required number at the Thornton Heath exchange. Not much help but it was later than May 1965. I lived in Diceland Road, across the road from the exchange, from the mid-'50s until early 1963, so I knew it well and visited it several times as a child. asked the Postmaster-General by what date the new automatic telephone exchange will be installed and operating at Burgh Heath, Surrey. My right hon. Friend plans to open the new automatic exchange at Burgh Heath during next summer. Is the Assistant Postmaster-General aware that the present exchange serves a most important and highly built-up area? Will he ensure that there is no delay in the opening of the new telephone exchange? Hi there I see this thread and would any body know a Florence Carter nee Jervis? She worked for Express Dairies in Bradford I think. She got remarried around 1950s1960s Also known as Florrie. I have been searching for information for years and this is the closest I have got. She is my grandmother whom I never got to meet, and her son and daughter (my mother )did not see my mam was 14 and is now 67,. Would be great to know about her. Thanks for reading. Note from LNW: Hi Siobhan, I have temporarily added your comment however I am not at all sure how Banstead comes into it! You never know, something might come of it. One question - Was your mother's maiden name Jervis or Jarvis? Hi and thanks so much for adding it. Her maiden name was Jervis. You never know as there have been a tread about Express Dairies as I have tried loads and been to places searching Thank you. Note from LNW: This is possibly a SPAM item but Shiobhan replied straight away so I will give her the benefit of the doubt for the time being. I am sure a genealogist would have this sorted in minutes! Thanks again. Really appreciate it. It's not a spam honest It's complicated as she was born in Ireland and moved to Bradford. The last my mam heard was she told my mam she was getting married but my mam does not know. Thanks again. Shiobhan, What is your mother's full name and date of birth and what was the surname of her other marriage? If you can provide some information, you have more of a chance of someone responding. there are numerous Florence Jervis on record! I have found a Jervis in Croydon but married name does not tally. Her name is Florence Carter nee Jervis born 1924 in Dublin Ireland. Moved to Bradford late 1950 early 60s. Was married to John Carter who was in the British army. The problem I'm having is I don't know if she did remarry but she had a son. My mother thinks his name was Patrick, but my mother thinks she overheard as a kid that Patrick was put up for adoption. Do you or your Mum have a copy of your Mum's birth cert? Yes Christine Kent I have a copy of my grandmothers birth cert. Mary Carter is my mam and Michael is her brother and I think that Peter could be my mams brother she never met that I think was adopted. Further to my post of September 2014 (and I apologise for the long delay), I was wrong about the bank being on the corner of High Street and Harbourfield Road. It was actually Buff Avenue, and the premises are now occupied by Sinnertons solicitors. Pass by and you can still see, on the front wall, where the night safe used to be. Look at this map on the web maps.nls.uk/view/103028658 on the National Library of Scotland website. Further to Peter's addition of 13 August - the bank at 175 High Street was Lloyds Bank. My Father was a good friend of Eddie Paine, one of the owners of Raylec just pre and post war. I had my first tape recorder from there and my deluxe B&O Hi-Fi system in the 70's;all our sound and vision equipment came from there. We were strong family friends with the Paines, Win And Ed,and their daughter Sue and husband Ashley,who just out of interest is the mother and father of the small actor Warwick Davies, lots of memories!! I have found this all very intriguing reading. I was born in Banstead in 1960 and have fond memories of the village - the shop which has alluded all mention is 'Rays quality Bargains' adjacent to the infants school grounds - now Waitrose car park. The shop was full of the most tacky 'made in Hong Kong' stuff imaginable - Ray had a 'lucky dip' type box. He used one of those sheds (the one someone mentioned had been a furniture repair workshop) on the alleyway for a store. I do remember the man with a limp - we ran past that shed on our way into the back garden of Glenfield Road - talking of which does anybody remember the name of the restaurant at the top of Glenfield road ? (now the pizza takeaway). If my memory serves me correctly the name of the restaurant at the top of Glenfield Road was Miguel.